Our research interests have included the investigation of new synthetic methods and the isolation and identification of biologically active natural products. With colleagues at Oak Ridge National Laboratory, we developed an analogical reasoning program to project potential synthesis routes and a neural net program based on a biological model. Dr. Schell earned his B.S. in pharmacy and his M.S. in pharmaceutical science from the University of Cincinnati. He then succumbed to the lure of natural products chemistry and earned his Ph.D. in organic chemistry from Indiana University. 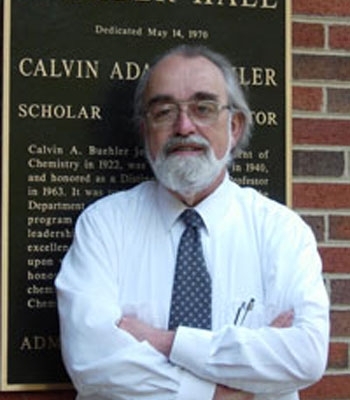 He joined the chemistry faculty at Tennessee in 1972. He has also been a research and development participant at Oak Ridge National Laboratory. Photo-aza-Claisen rearrangements of cyclic enaminones. W. Kraus, F.M. Schell, R. Bayer, M. Meller and B. Vogler, J. Org. Chem. 54, 4165 (1989). Analysis of chemicals from earthworms and fish that elicit prey attack by ingestively naive garter snakes (Thamnophis). F.M. Schell, G.M. Burghardt, A. Johnston and C. Coholich, J. Chem. Ecol. 16, 67 (1990). Neural nets and eddy-current testing. J.D. Allen, Jr., J.R. Pate, C.V. Dodd, and F.M. Schell, Review Progress in Quantitative Nondestructive Evaluation 10A, 651 (1991). Characterization of volatile, hydrophobic cyclodextrin derivatives as thin films for sensor applications. M. Culha, N.V. Lavrik, F.M. Schell, C.A. Tipple, and M.J. Sepaniak, Sens. Actuator B 92, 171 (2003).